Sales Contractors identify potential customers, demonstrate product benefits, and render sales offers to customers. 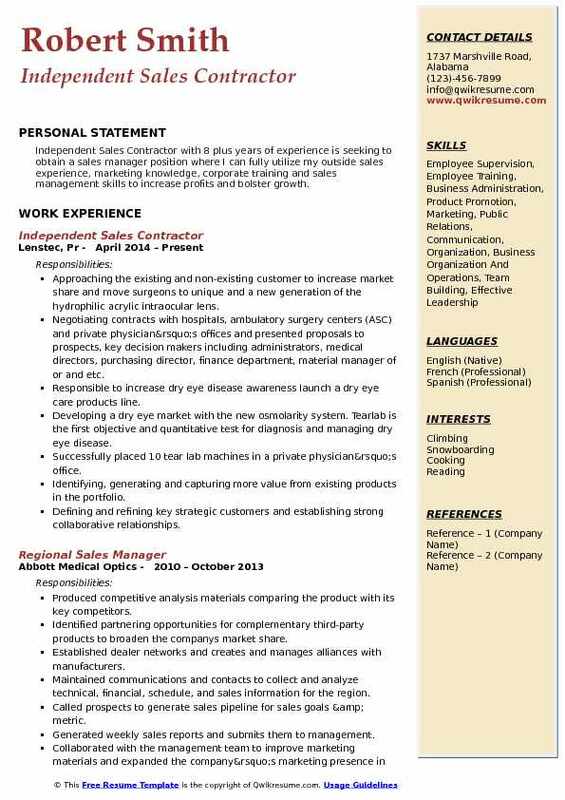 The roles and responsibilities attached to this job role include tasks such as promoting products, presenting sales and service to existing and prospective customers, identifying potential customers through cold calling, coordinating sales effort, analyzing market trends, providing after-sales support, reporting to management regarding customer needs, problems and interests. 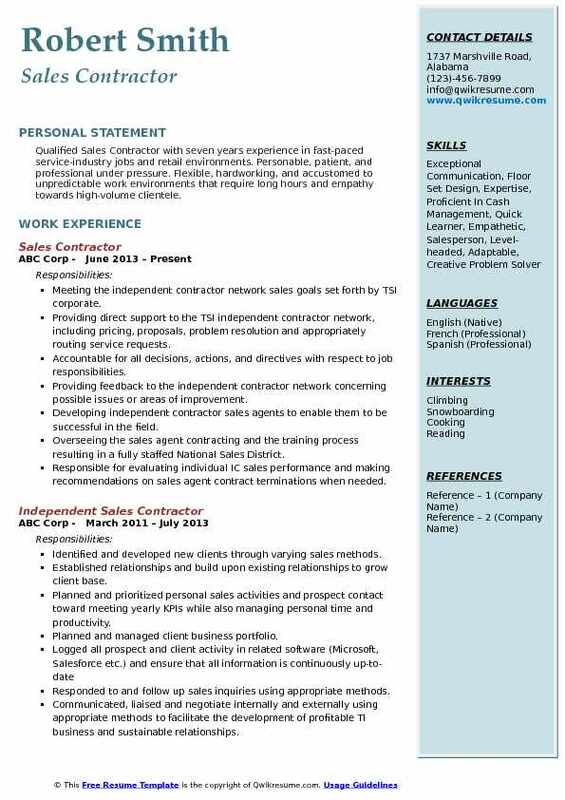 A well-drafted Sales Contractor Resume showcases skills such as business acumen, sales expertise, interpersonal skills, teamwork, excellent communication, a thorough knowledge of MS Office, BRM and CRM practices; the ability to build productive business opportunities, target driven attitude, and a good track record of achieving sales quota. No formal education is needed as such for this post, but most of the sales contractors mention in the resume a high school diploma or its equivalent. 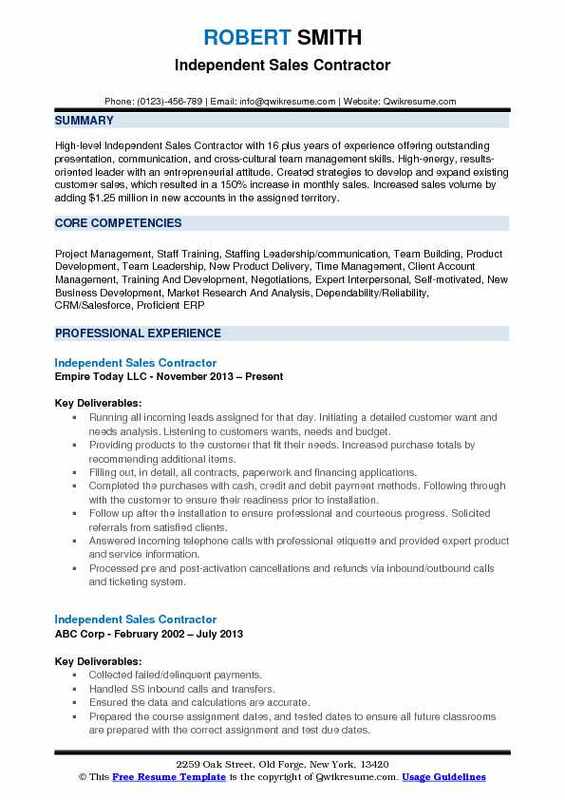 Summary : Sales Contractor with 11 plus years of experience in the Technology domain. 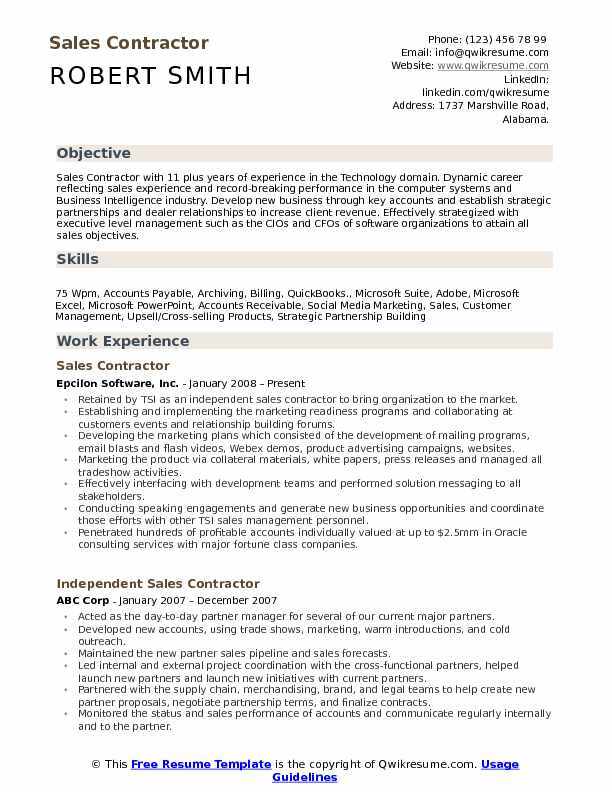 Dynamic career reflecting sales experience and record-breaking performance in the computer systems and Business Intelligence industry. Develop new business through key accounts and establish strategic partnerships and dealer relationships to increase client revenue. Effectively strategized with executive level management such as the CIOs and CFOs of software organizations to attain all sales objectives. Retained by TSI as an independent sales contractor to bring organization to the market. Establishing and implementing the marketing readiness programs and collaborating at customers events and relationship building forums. Developing the marketing plans which consisted of the development of mailing programs, email blasts and flash videos, Webex demos, product advertising campaigns, websites. Marketing the product via collateral materials, white papers, press releases and managed all tradeshow activities. Effectively interfacing with development teams and performed solution messaging to all stakeholders. Conducting speaking engagements and generate new business opportunities and coordinate those efforts with other TSI sales management personnel. Penetrated hundreds of profitable accounts individually valued at up to $2.5mm in Oracle consulting services with major fortune class companies. Developing and managing every aspect of the sales cycle which involved effective prospecting, cold calling, delivering effective voice mail messages, preparing email campaigns that break past the "delete" barrier, developing email blasts and flash videos that produce results, and marketing collateral materials that win appointments. Summary : High-level Independent Sales Contractor with 16 plus years of experience offering outstanding presentation, communication, and cross-cultural team management skills. High-energy, results-oriented leader with an entrepreneurial attitude. Created strategies to develop and expand existing customer sales, which resulted in a 150% increase in monthly sales. Increased sales volume by adding $1.25 million in new accounts in the assigned territory. Running all incoming leads assigned for that day. Initiating a detailed customer want and needs analysis. Listening to customers wants, needs and budget. Providing products to the customer that fit their needs. Increased purchase totals by recommending additional items. Filling out, in detail, all contracts, paperwork and financing applications. Completed the purchases with cash, credit and debit payment methods. Following through with the customer to ensure their readiness prior to installation. Follow up after the installation to ensure professional and courteous progress. Solicited referrals from satisfied clients. Answered incoming telephone calls with professional etiquette and provided expert product and service information. Processed pre and post-activation cancellations and refunds via inbound/outbound calls and ticketing system. Inputted eCommerce orders into K12’s proprietary Order Management System for digital and material fulfillment. Handled all requests for materials reshipment, including a collection of payment. 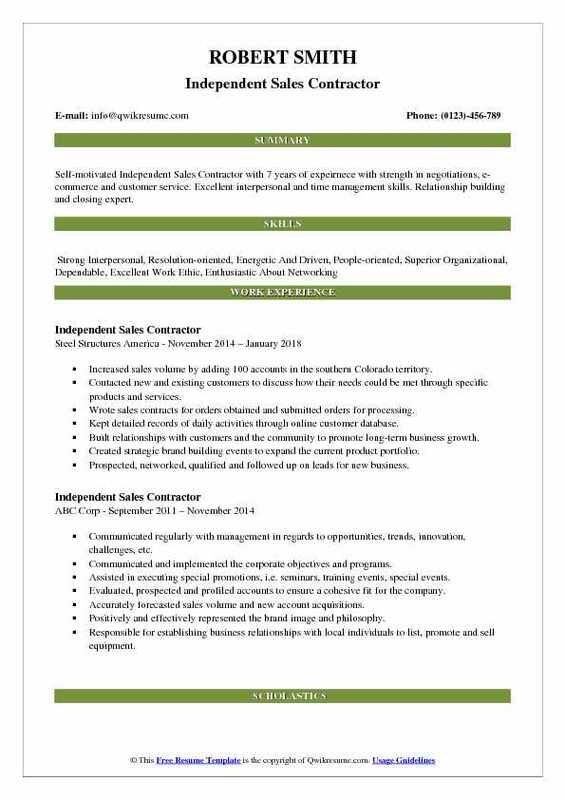 Summary : Self-motivated Independent Sales Contractor with 7 years of expeirnece with strength in negotiations, e-commerce and customer service. Excellent interpersonal and time management skills. Relationship building and closing expert. Increased sales volume by adding 100 accounts in the southern Colorado territory. Built relationships with customers and the community to promote long-term business growth. Prospected, networked, qualified and followed up on leads for new business. Presented and closed the prospects to meet or exceed quarterly territory objectives. Customized and managed promotional plans/strategies to drive sales within each account. Monitored production of all top accounts and evaluate trends within your market. 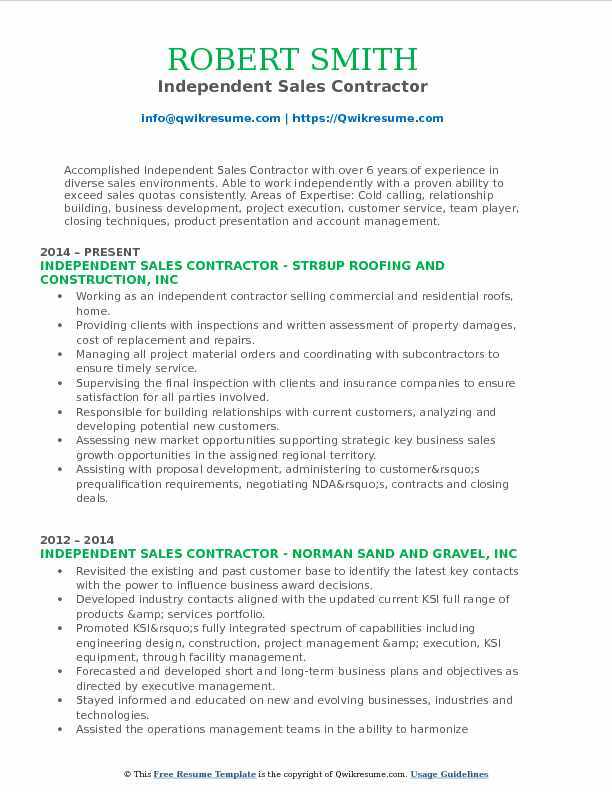 Summary : Independent Sales Contractor I with 13 years of experience with successful growth record and demonstrated the ability to seek out and develop new business relationships. Excels at building and maintaining a productive client base through a persistent sales approach and strong ability to interpret and respond to client needs. Excels at communication, presentation and event coordination skills and use of market research and its applications. Independent sales contractor for Herff Jones Scholastic Division in Western Missouri, Northeast Kansas, and portions of Nebraska. Responsible for a two-level sale inside the school building to include the decision maker (superintendant/principal) as well as the individual sale to the end consumer (student/parent). Grew a distressed territory from $100,000 to $440,000 in annual sales with commissions of $110,000. Responsible for all aspects of running the business/territory management including prospecting, marketing, client presentations, contracts, employee scheduling, individual student sales, customer service, collections, order submissions, product delivery and reconciliations, expense management and benefits. Developed forecasts, profit loss statements, product value/pricing strategies. Provided customers and coworkers with a remarkable experience. Demonstrated a good work ethic based on principles of honesty and integrity. Performed various other job duties as assigned and needed. 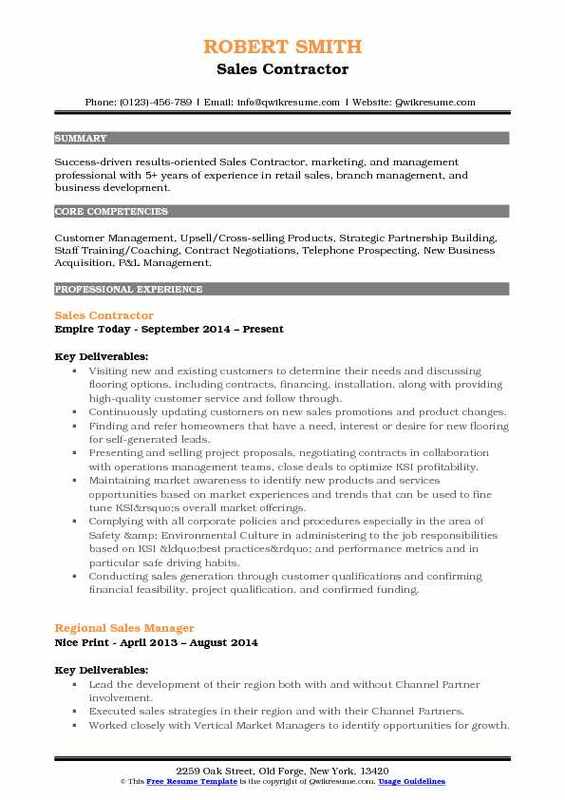 Summary : Qualified Sales Contractor with seven years experience in fast-paced service-industry jobs and retail environments. Personable, patient, and professional under pressure. Flexible, hardworking, and accustomed to unpredictable work environments that require long hours and empathy towards high-volume clientele. Meeting the independent contractor network sales goals set forth by TSI corporate. Providing direct support to the TSI independent contractor network, including pricing, proposals, problem resolution and appropriately routing service requests. Accountable for all decisions, actions, and directives with respect to job responsibilities. Providing feedback to the independent contractor network concerning possible issues or areas of improvement. Developing independent contractor sales agents to enable them to be successful in the field. Overseeing the sales agent contracting and the training process resulting in a fully staffed National Sales District. Responsible for evaluating individual IC sales performance and making recommendations on sales agent contract terminations when needed. Knowledge, understanding, compliance, and enforcement of independent contractor status (1099), as well as, all applicable Federal, State, and Local laws and regulations relating to job duties. Following up in a timely manner to ensure customer satisfaction. Providing feedback to management concerning possible problems or areas of improvement. 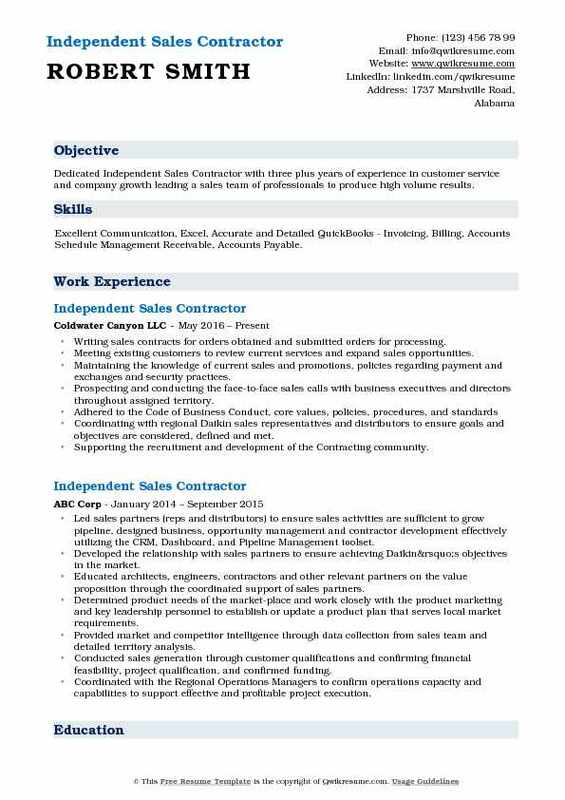 Objective : Dedicated Independent Sales Contractor with three plus years of experience in customer service and company growth leading a sales team of professionals to produce high volume results. Skills : Excellent Communication, Excel, Accurate and Detailed QuickBooks - Invoicing, Billing, Accounts Schedule Management Receivable, Accounts Payable. Writing sales contracts for orders obtained and submitted orders for processing. Meeting existing customers to review current services and expand sales opportunities. Maintaining the knowledge of current sales and promotions, policies regarding payment and exchanges and security practices. Prospecting and conducting the face-to-face sales calls with business executives and directors throughout assigned territory. Coordinating with regional Daikin sales representatives and distributors to ensure goals and objectives are considered, defined and met. Supporting the recruitment and development of the Contracting community. Developed a training program on sales technique by using the assumptive close as well as the choice close. 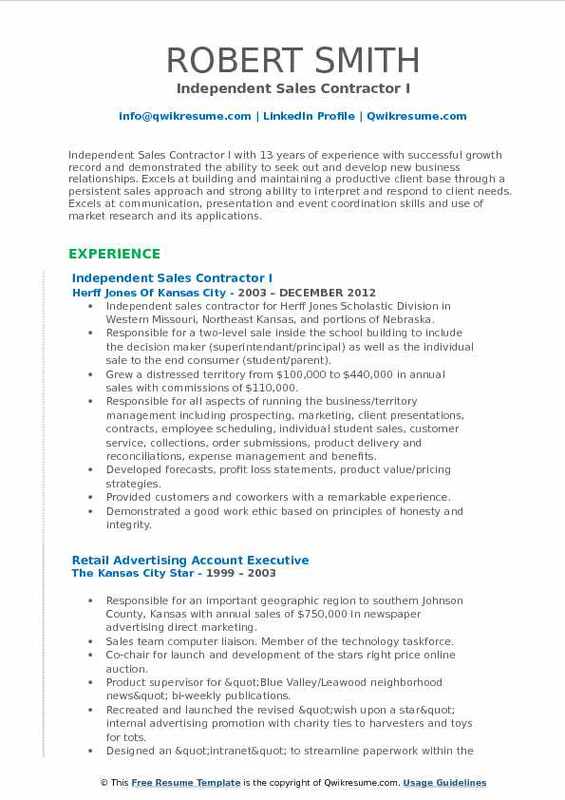 Headline : Accomplished Independent Sales Contractor with over 6 years of experience in diverse sales environments. Able to work independently with a proven ability to exceed sales quotas consistently. Areas of Expertise: Cold calling, relationship building, business development, project execution, customer service, team player, closing techniques, product presentation and account management. Working as an independent contractor selling commercial and residential roofs, home. Providing clients with inspections and written assessment of property damages, cost of replacement and repairs. Managing all project material orders and coordinating with subcontractors to ensure timely service. Supervising the final inspection with clients and insurance companies to ensure satisfaction for all parties involved. Responsible for building relationships with current customers, analyzing and developing potential new customers. Assessing new market opportunities supporting strategic key business sales growth opportunities in the assigned regional territory. Assisting with proposal development, administering to customer’s prequalification requirements, negotiating NDA’s, contracts and closing deals. Identifying, prequalifying, and developing new opportunities for clients including key contacts that are focused within the target market segments. Building strong business relationships with all key personnel that can influence business decisions to favor KSI. Headline : Success-driven results-oriented Sales Contractor, marketing, and management professional with 5+ years of experience in retail sales, branch management, and business development. Skills : Customer Management, Upsell/Cross-selling Products, Strategic Partnership Building, Staff Training/Coaching, Contract Negotiations, Telephone Prospecting, New Business Acquisition, P&L Management. Visiting new and existing customers to determine their needs and discussing flooring options, including contracts, financing, installation, along with providing high-quality customer service and follow through. Continuously updating customers on new sales promotions and product changes. Finding and refer homeowners that have a need, interest or desire for new flooring for self-generated leads. Presenting and selling project proposals, negotiating contracts in collaboration with operations management teams, close deals to optimize KSI profitability. Maintaining market awareness to identify new products and services opportunities based on market experiences and trends that can be used to fine tune KSI’s overall market offerings. Complying with all corporate policies and procedures especially in the area of Safety & Environmental Culture in administering to the job responsibilities based on KSI “best practices” and performance metrics and in particular safe driving habits. Conducting sales generation through customer qualifications and confirming financial feasibility, project qualification, and confirmed funding. Coordinating with the Regional Operations Managers to confirm operations capacity and capabilities to support effective and profitable project execution. 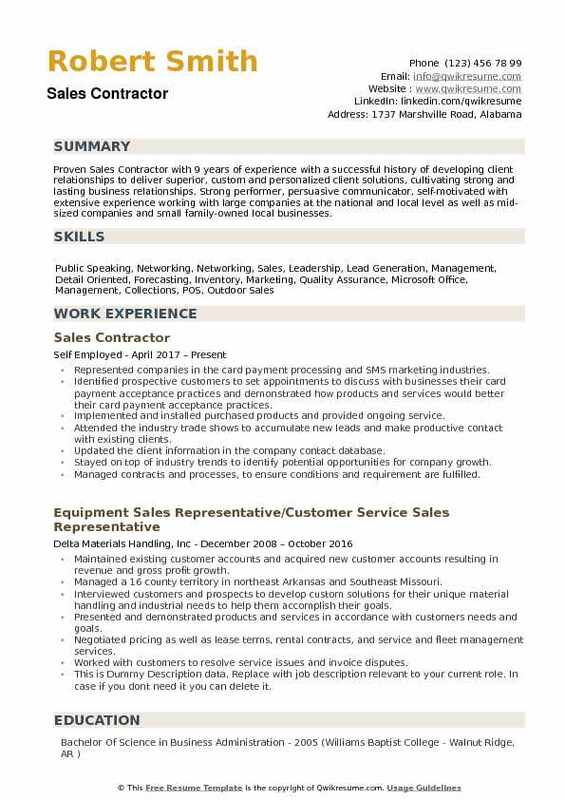 Summary : Independent Sales Contractor with 8 plus years of experience is seeking to obtain a sales manager position where I can fully utilize my outside sales experience, marketing knowledge, corporate training and sales management skills to increase profits and bolster growth. Approaching the existing and non-existing customer to increase market share and move surgeons to unique and a new generation of the hydrophilic acrylic intraocular lens. Negotiating contracts with hospitals, ambulatory surgery centers (ASC) and private physician’s offices and presented proposals to prospects, key decision makers including administrators, medical directors, purchasing director, finance department, material manager of or and etc. Responsible to increase dry eye disease awareness launch a dry eye care products line. Developing a dry eye market with the new osmolarity system. Tearlab is the first objective and quantitative test for diagnosis and managing dry eye disease. Successfully placed 10 tear lab machines in a private physician’s office. Identifying, generating and capturing more value from existing products in the portfolio. Defining and refining key strategic customers and establishing strong collaborative relationships. Conducting market research and identifying and tracking market trends. Summary : Proven Sales Contractor with 9 years of experience with a successful history of developing client relationships to deliver superior, custom and personalized client solutions, cultivating strong and lasting business relationships. Strong performer, persuasive communicator, self-motivated with extensive experience working with large companies at the national and local level as well as mid-sized companies and small family-owned local businesses. Represented companies in the card payment processing and SMS marketing industries. Identified prospective customers to set appointments to discuss with businesses their card payment acceptance practices and demonstrated how products and services would better their card payment acceptance practices. Implemented and installed purchased products and provided ongoing service. Attended the industry trade shows to accumulate new leads and make productive contact with existing clients. Updated the client information in the company contact database. Stayed on top of industry trends to identify potential opportunities for company growth. Managed contracts and processes, to ensure conditions and requirement are fulfilled. Analyzed the territory/market’s potential, track sales, and status reports.